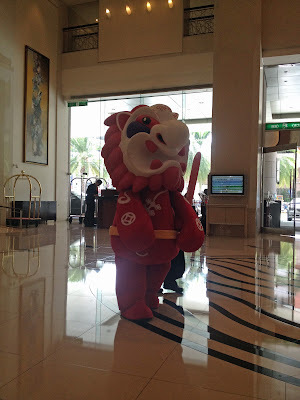 While in Tao Yuan I stayed at the Tayih Landis Hotel, they have these lion mascots. The hotel was really nice and compared to US standards a bargain. Anyhow when I saw one of their staff dressed up in the giant lion costume I couldn't resist snapping a picture. 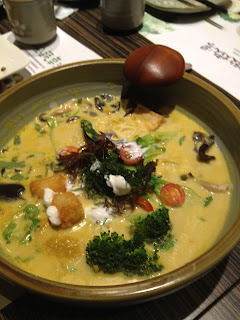 Anyhow, my girlfriend and her family took me to this vegetarian restaurant Easy House. I wish I took pictures of the restaurant, very modern open seating design. There's been a recent surge in demand for vegetarian cuisine in Taiwan the reasons behind it are unclear to me, reading around the web gives various answers from general increases in the price of food or increase popularity of the adoption of Buddhism. Either way I've found that vegetarian cuisine here is different from my impression of vegetarian food in America. I have a hard time giving up meat, I know there's a good variety of reasons people do so, but the bottom line for me is that generally after eating a vegetarian meal I feel quite dissatisfied. My girlfriend has a good phrase for it, "My stomach is full but my heart is empty". I have to say that after eating at Easy House I was genuinely surprised at how full and "satissfied" I felt. So here's what we had. First up was a fresh vegetable salad. The salad was mostly large chunks of vegetables with very little "leafy green". One of the vegetables was leaves of a succulent plant that never occurred to me as edible (I've been scouring the web and can't seem to identify this leaf). I didn't snap a picture but I'll have to track it down and post it here. It's one of those you usually see in people's zero-scape gardens. Anyhow, all of it was tossed with a vinaigrette which I could not identify. The interesting thing here was a texture play of using toasted/fried barley. The use of the grain gave a nutty flavor to the salad and a nice crunchy texture that would normally be the "croutons" in a traditional salad. 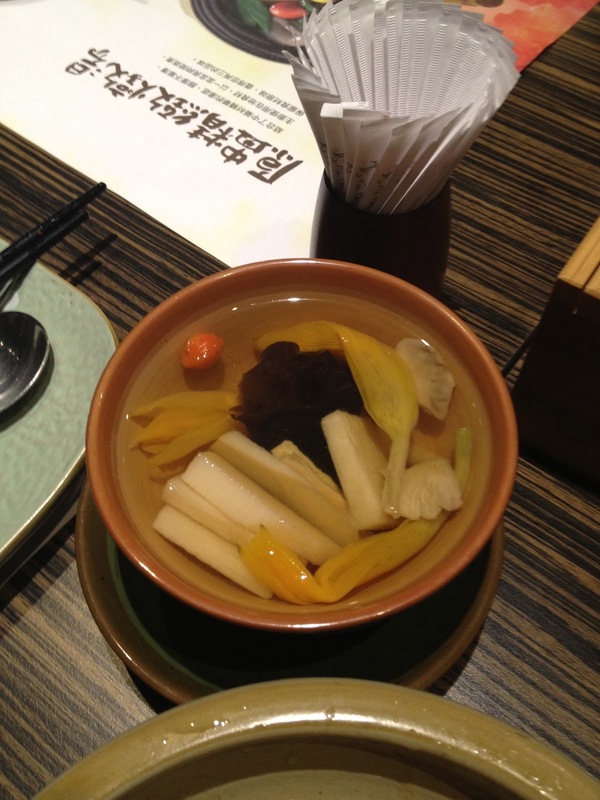 The soup course was a Chinese herbal soup. It had goji berries and several variety of mushrooms including abalone, wood ear and shitake mushrooms and some sort of lilly blossom. I liked the use of multiple types of mushroom and the broth was extremely flavorful. 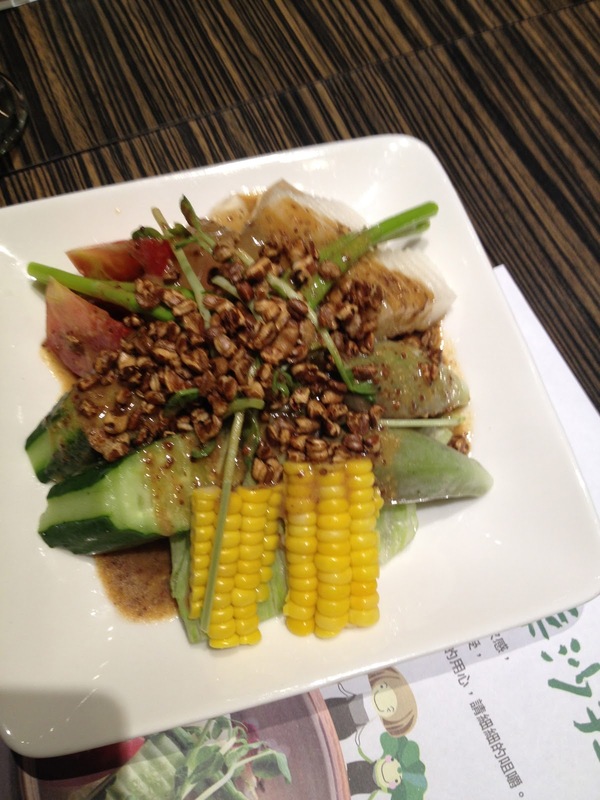 We ordered the fixed menu for one and supplemented with additional salad as well as this side dish "Gao Li Cai". Although it's said to be sautéed cabbage I find it hard to believe this is the same napa cabbage that we have in the states. The ribs of the cabbage were more tender and the leaves tasted more like sauteed iceberg lettuce. Maybe they blanch it first before they sauteed it with goji, lilly blossoms and shitake mushrooms. 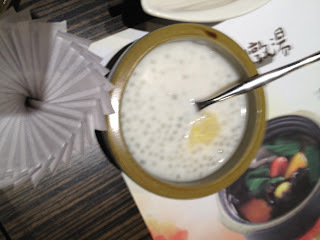 Finally dessert was a coconut taro tapioca pudding. The yellow blob in the center was some sweetened green mung bean. Lovely cold "soup" dessert that wasn't too sweet. As you can see it was a large quantity of food. But it wasn't the quantity that made the meal satisfying it was the fact that I ate everything without a single thought of how meat would play into the meal and make it better. It stood on it's own using the ingredients as they were without apologizing for being vegetarian by trying to mock some sort of meat. (e.g. using tofu and making fake duck). I thoughroughly enjoyed the experience. Ok I get to do a bento this weekend so maybe you'll finally see a bento post from me.